Among the Indian population of 1.1 billion people are more than 414 million children. The majority are living in great poverty and without any hope for a better future. Children from poorest background, as well as semi- and full orphants, find admission, security and affectionate love and care in our homes. Children from poorest conditions come daily in our day-care centers and receive affectionate care through our local co-workers. 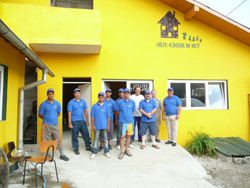 We do actual voluntary social work in different districts of Romania. To give our children from our homes a long term perspective, we offer them after completing high school a vocational training. In our training center at Bangalore young people receive various job educations. Because of high unemployment rate older youths have no chance to get a vocational training, so we started to built up a own Training-Center. In this Carpentry our youths will learn the needed skills.